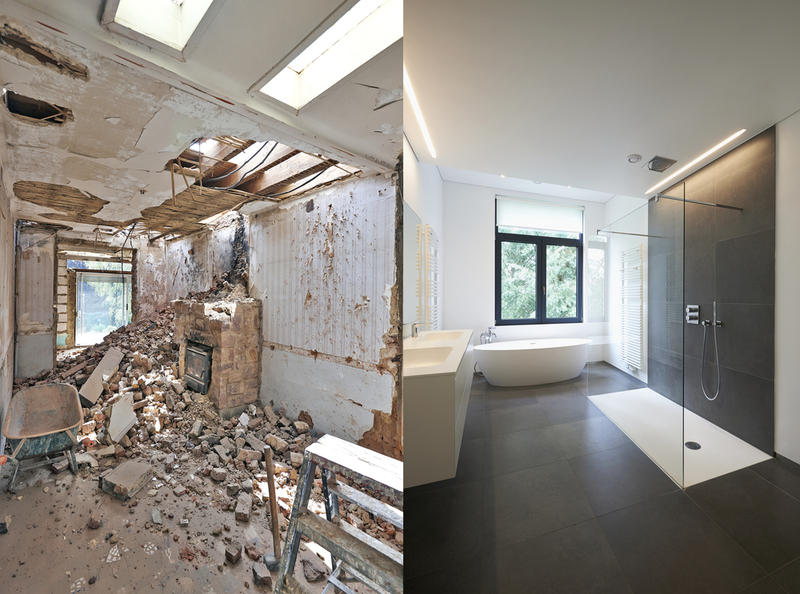 Ask any architect, interior designer, or contractor and they will readily tell you that one of the most expensive part of home building is the construction—and finishing—of the bathroom. Yes, the much used, and abused, banyo. You may be a young couple excited about starting a family, and looking forward to seeing your first dream home, or perhaps a middle-aged couple with grown-up kids, envisioning the outcome of your bathroom remodeling. Regardless of circumstance, one common factor when going through a construction is budget limitation. When it comes to budget allocation, it is not uncommon to hear people say that they’d be willing to swap the grandness of an opulent living or dining room for a clean and well-appointed bathroom. After all, the bathroom is every man’s own quintessential private headquarters, the epitome of his oneness with himself, the ultimate…well, COMFORT room. 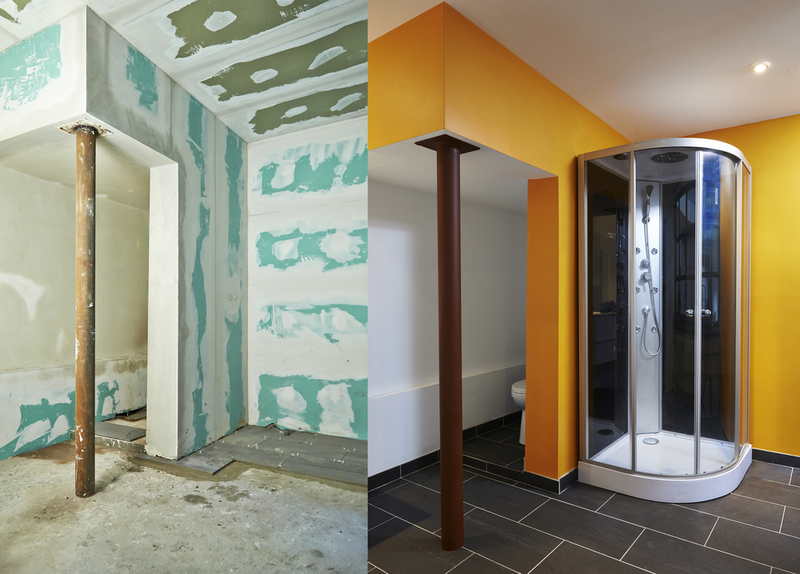 There are all sorts of ways that a would-be homeowner can ensure that he gets the most out of his hard-earned money in terms of cutting down the cost of bathroom construction. One way is to immediately determine whether you’ll go for a tub, or a shower enclosure. My own experience taught me not to be too excited about replicating what I’ve seen in other people’s homes, and instead focus on what I really do want for myself and what works for me and my family. I was all too thrilled then to have a bathtub installed in the master bathroom, only to find myself having to pay a worker years later to have it removed. I realized belatedly that I didn’t like to have to hop over the ledge of the tub day in and day out. I wanted to keep things simple, and I also welcomed the extra space that came with its removal. Another area for cost savings would be the bathroom fixtures. Matte-finish fixtures are oftentimes more expensive than the glossy ones. When I had our bathrooms remodeled, I preferred the matte ones over the glossies, as the former exuded a more modern feel. But the matte ones were playing hard to get, it was quite costly. So the compromise was—I still purchased the matte fixtures but settled for the slim-line…less bulky, less expensive. Brilliant, huh? They were more affordable, and even looked very stylish and contemporary. One budget roadblock that we can all consider a major one is the expense of bathroom tiling. While there is a large assortment of tiles available in the market now, the really good ones can cost you an arm and a leg, not to mention the labor cost that comes with it, plus throw in the mess and dust you have to deal with from all that tile grinding. It can take quite a while too, to get the job done. Tile installation too costly for you? Here’s a tip. Keep the tiling to a minimum, say just the flooring. Get that can of paint and start painting your walls. Probably the most important aspect of painting a wall is what comes before it, and that is wall or surface preparation. If the bathroom is already being constructed, and you got a worker who does great masonry work, then your painting job will be a breeze. You can even choose to go DIY with painting your walls, to further save on labor cost. You may even be surprised to later see that the painted wall treatment looks more jazzy than a conventional-tiled bathroom. Lower cost, yet high-end look. All the better! Using the right kind of paint is also key. 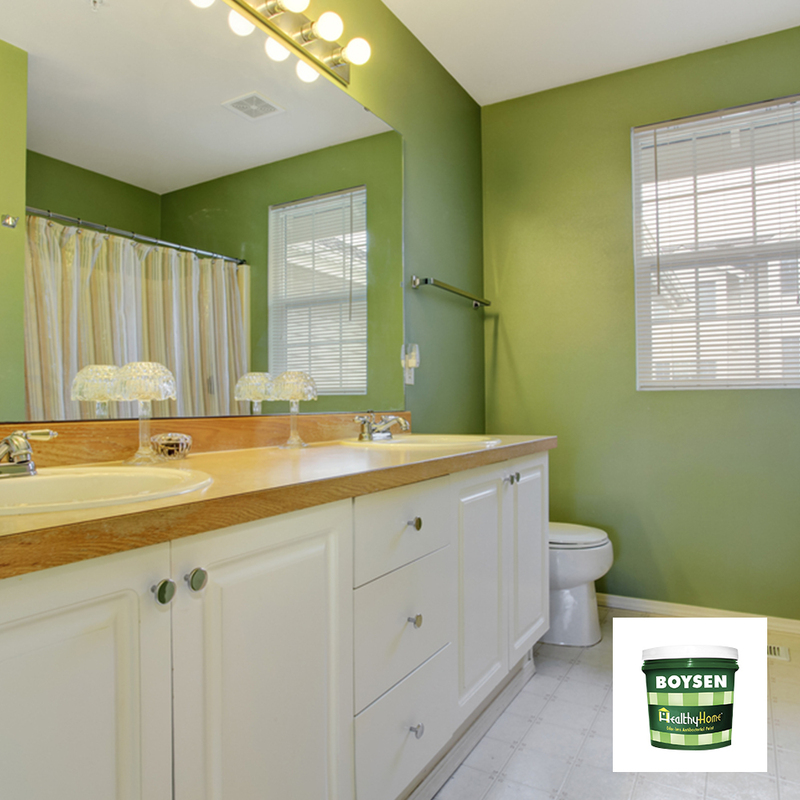 Among Boysen’s numerous lines of quality paints, I would recommend using Virtuoso and Healthy Home for the bathroom. What’s the advantage of one over the other? Depending on your requirements, you are likely to find one that suits your needs. Both Virtuoso Silk Touch and Healthy Home Odor-less Antibacterial paints are equipped with Antibacterial Protection Technology. This assures you that your bathrooms, porous walls notwithstanding, will allow you and your family to enjoy cleaner surroundings. Aside from its antibacterial properties, Virtuoso Silk Touch is your go-to paint if you want the low-sheen finish and easy-clean feature. Your walls will be very low-maintenance, because it has Dupont’s Teflon component, which gives the paint a natural resistance against common household stains. A bonus feature is that it’s odor-less, so it’s friendly to use for those who want to go DIY. For the obsessive-compulsive who want to push for lower costs, Healthy Home is a great fit. Since it’s water-based, it’s also odor-less and its inherent antibacterial protection gives extra defense against microbes, mildew and fungus. 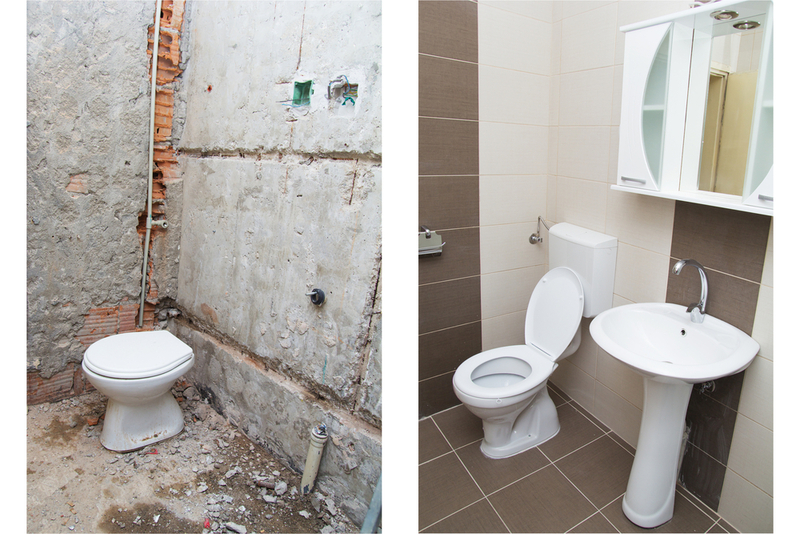 So you are assured of an easy-to-clean, hygienic bathroom. Go ahead, go DIY! Quality painted walls is the new sophisticated. Achieve the elegance you want, at a fraction of the cost. Win-win na ang scenario, bongga pa ang banyo. Lee is a doting mom to her three blossoming gentlemen. She loves to talk, listen to stories, and read about life stuff. When not doing consultancy work or writing, she dabbles in real estate.